Posted on Saturday, May 12th, 2012 at 10:00 am. 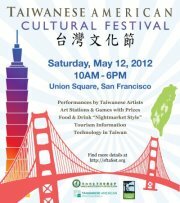 Started in 1993, the Taiwanese American Cultural Festival has grown into an annual landmark event for the Bay Area community, drawing thousands of visitors from all over the world to experience Taiwan’s unique cultural heritage and to recognize the contributions of Taiwanese Americans today! The festival enhances social interactions and cultural exchanges among communities with different ethnic backgrounds and strengthens relations between the United States and Taiwan – emphasized by this past year’s Why Taiwan Matters Congressional Hearings. The exhibitions at the festival will include demonstrations using Taiwanese glove puppets, Taiwanese arts and crafts, games with prizes, visual displays to illustrate Taiwanese technology, as well as a marketplace with orchids from Taiwan. Craving for delicious Taiwanese food? There will be all sorts of specialty foods, including red bean cake, fried vermicelli, tea eggs, Hakka mochi, bean curd with peanuts! Save the date! Immerse yourself into rich Taiwanese culture!